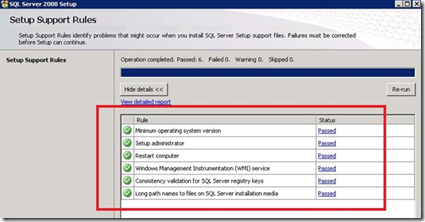 When we do installation or removing SQL Server, it always executes installation rules. And what really weird is, installer even checks for these rules when we want to Un-install the SQL Server (kind of reminds me, my experience with Office ‘97 which had quite similar craving for installation media while uninstalling). Today, when we were trying to install SQL server on one of our test machine which was built freshly from scratch was acting really weird. When I ran the installation, it executed installation rules as usual to check if there is something missing. But I got this common error saying “RebootRequiredCheck: Failed”, which basically says that System Reboot is Required, so we thought it might be because of some update (Windows does have really bad habit of asking to reboot every now and then after updates ). So we did as required by SQL Server and rebooted the system. Then we again fired the installation process and guess what ?? we had again same error !! We tried couple of other stuffs like cleaning temp files and stopping services which might be causing this problem but it didn’t worked even after 3-4 reboots. So, finally wise guy (me :D) thought to Google this problem, and I found that this error has nothing to do with SQL Server itself !! Actually it is because of Windows … apparently, when there is some updates are done or some critical software is installed, windows sets a parameter in registry which makes that windows gets rebooted once that process is completed. 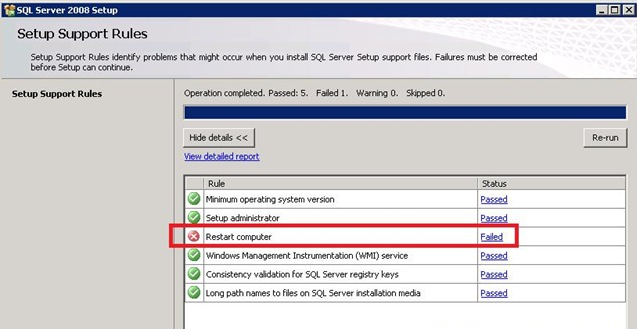 But somehow, that registry value doesn’t get reset even after reboot and that can cause trouble for SQL Server !! So, we have to manually remove that value from registry. 1. Fire Regedit.exe application in Windows. 2. Go to, HKEY_LOCAL_MACHINE\SYSTEM\CurrentControlSet\Control\SessionManager , and instead of “EXPANDING” Session Manager, “SELECT” it and you will see the entry called, PENDING FILE RENAME OPERATION. 3. Take backup of registry value first. 4. Then, If PENDING FILE RENAME OPERATION has any values just remove it and clear the value. 5. Reboot the System and again go to PENDING FILE RENAME OPERATION and see if there is any values still available. 6. If no value is there then simply fire the installation process. 7. If any value is still present then simply remove that value and without restarting fire the installation process. And after this everything went super smooth for us (or say for me ). Actually there are some other causes of this type of error too. 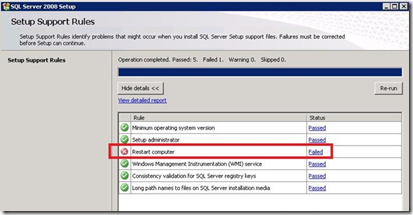 To be honest, surprisingly I found only one post to the point this specific error and I have included link over there, which has some other causes that can make SQL Server installer to generate same error. Well, I learned something new today. And I hope that you too may have found this information (or say Re-Post) a bit helpful. This entry was posted by Gaurang on September 22, 2010 at 7:43 pm, and is filed under How To, SQL Server, Tips. Follow any responses to this post through RSS 2.0. You can leave a response or trackback from your own site.